This is one of our regular rotation dinners. If you’ve read my What’s For Dinner posts you probably have seen it in my weekly menus. 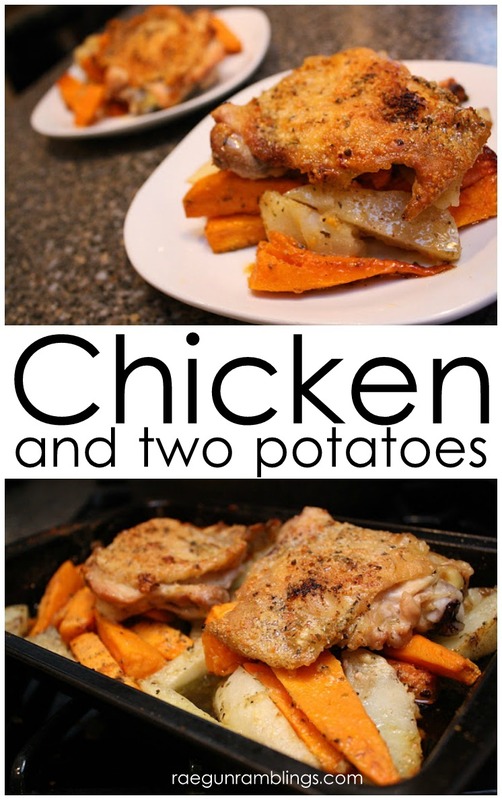 I like this recipe because it’s relatively easy, if you have frozen chicken the other ingredients last forever so it’s easy to have them on hand, and it’s yummy. It’s one of those meals that you don’t have to be in the mood for it’s tasty and filling whenever. Toss with garlic salt. Pour into baking dish. Sprinkle herbs and parmesan on top. Cut under side of thighs so they open more. Lay on top of potatoes, sprinkle with more sprinkle herbs and parmesan on top. Spray with oil. We love this recipe so much it’s one that’s in our regular dinner rotation so easy to make and it always tastes yummy! Looking for other great chicken ideas? 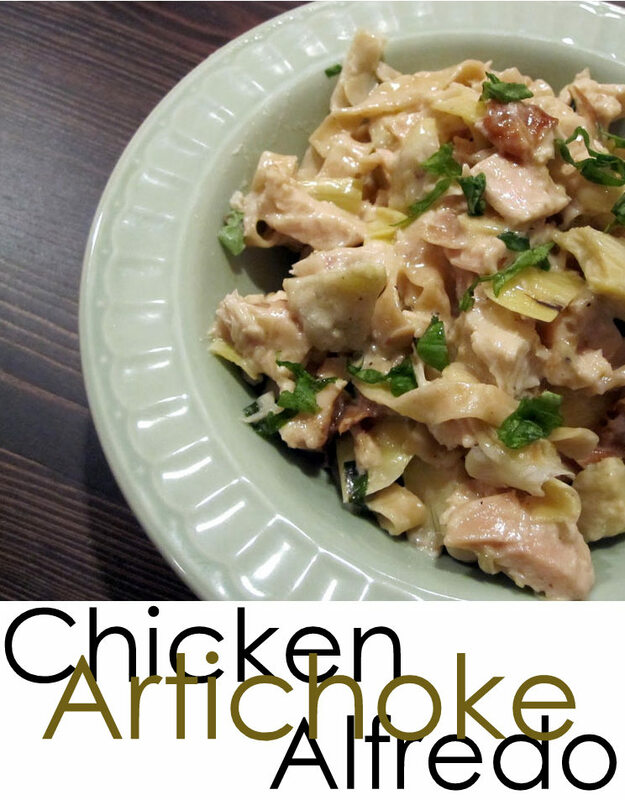 Here’s a super tasty and delicious Chicken Artichoke Alfredo recipe. And do you know how to quickly and beautifully carve chicken? 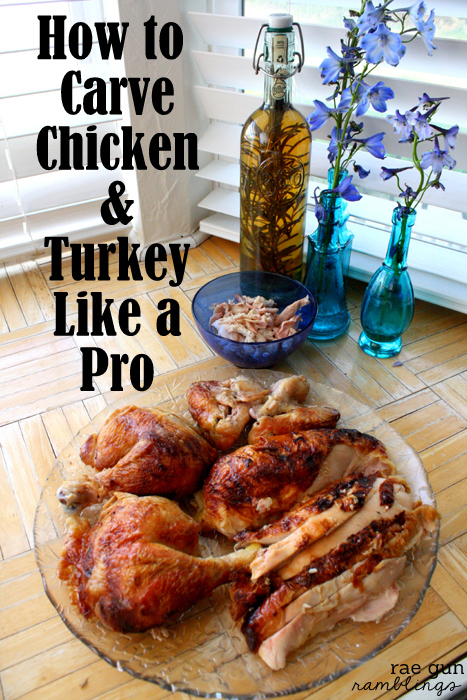 Great tips that can even be used on a rotisserie chicken or Thanksgiving turkey. Yummo I am certainly going to put this on the menu plan. OOOh delicoso!! This looks simply and yummy!! Love roast chicken dinners like that! This looks good and i bet you can use a variety of seasonings and veggies to change it up. Thanks for the idea! This look like a great recipe. I love chicken and potatoes!! Thanks for sharing this on the Take it on Tuesday blog hop. I’m pinning this! My family serves a different version of baked chicken and vegetables that is a little similar to this. 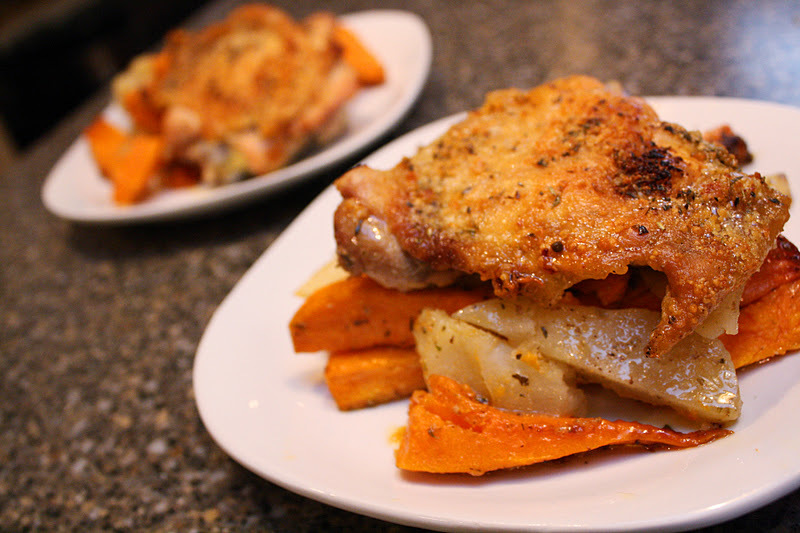 We’ve never tried the Parmesan, but the chicken in your pictures looks so mouthwatering, I think we need to try that. Thanks for sharing this great recipe at the Your Cozy Home Party. I appreciate your visits Marissa. Mmm…so creative! Thank you for linking up to the first “Cowgirl Up!” Linky Party! That sounds really good, I’ll have to try that one of these nights! I’ve pinned it to come back to. I found you via the Gingersnap Crafts Link Party. Looks great, we eat lots of chicken. Pretty pics too. That looks YUMMY!!!!! I’m saving this! Yum! This is right up my alley. Thanks for sharing! This looks delicious! I’m a new Linky follower and subscriber to your blog. :) Pinning this recipe!